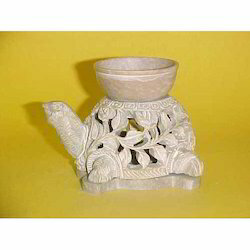 Soft stone carved aroma burner. We offer a wide range of incense accessories like burner in brass, wood, stone, aluminium etc. Indian heritage is a treasure trove of some of the best craftsmanship and is reputed for its superb quality handicrafts which possess a lucrative foothold in the markets of north america, south america, europe, gulf and australia. We deals in Stand used in hotels, restaurants, banquets and industries. Our products are widely acclaimed for finest quality. Our main motto is Customer delight.